And I’m back! 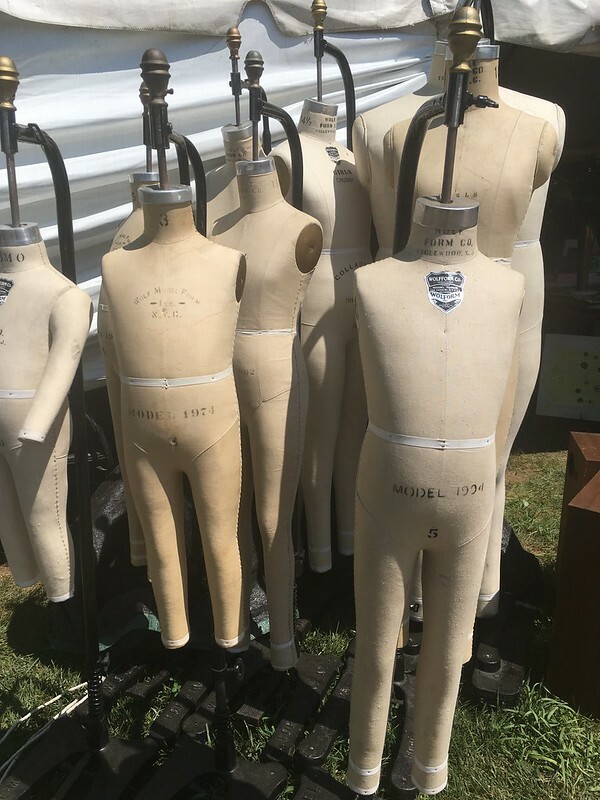 After taking a little more than a month off of blogging, it’s time to get back to it, and first up is a report on my trip to Brimfield Antique Show in mid-July. 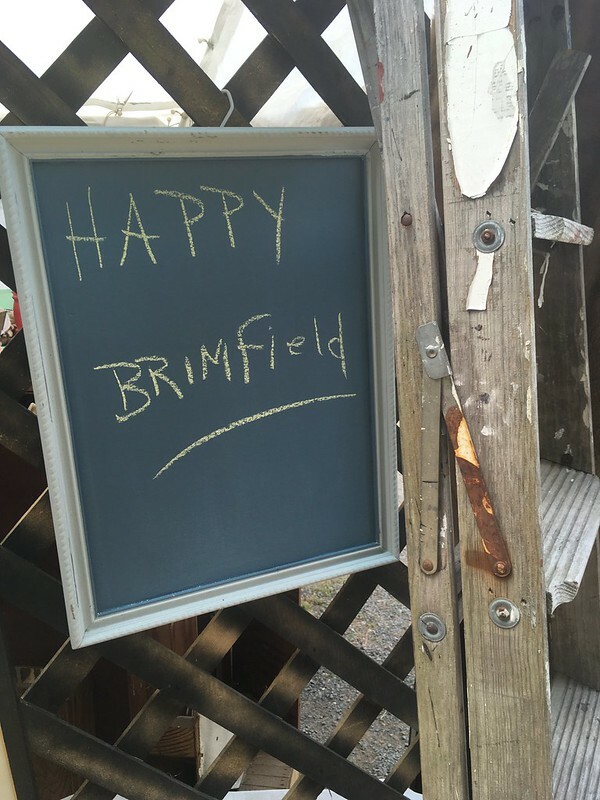 For anyone who hasn’t heard of Brimfield, it’s a small town in western Massachusetts that hosts the largest outdoor antique show in the US three times a year (May, July, and September) for about a week (Tuesday-Sunday). I love antiquing, and while I don’t get to go every year, I make it for a day when I can. The show (which is really a collection of different fields) stretches out on either side of a one-mile strip of road. 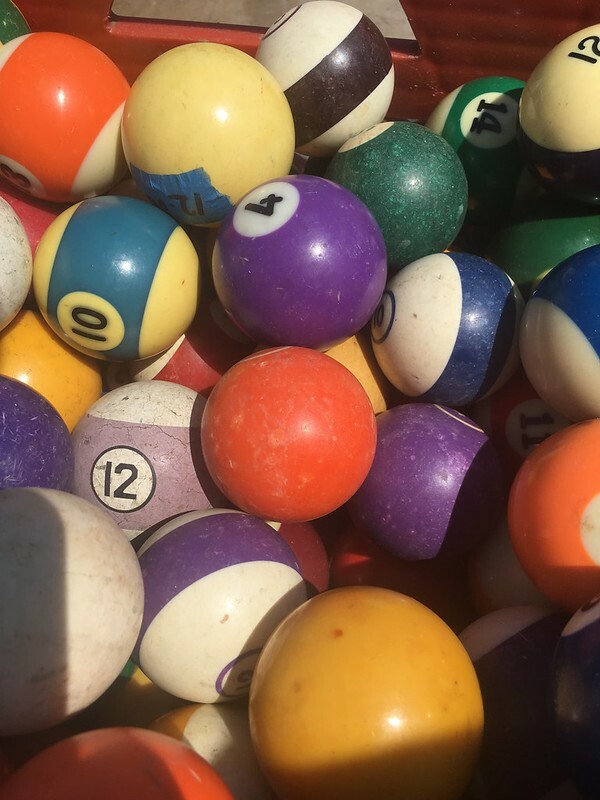 You never know what you will find, from sought-after antiques (and new things that play well with antiques), to repurposed items, to raw materials to make your own upcycled creations. I love antiquing. A full day of wandering through the fields with a friend or by myself is one of my favorite kinds of days. 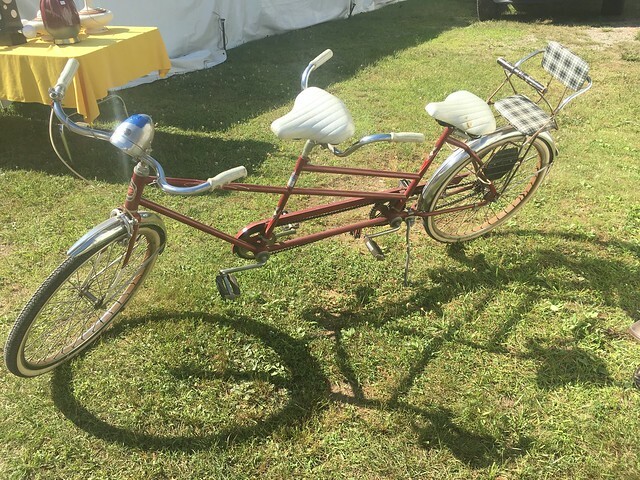 This July, my best Brimfield buddy Jo-Alice (of Hillcraft Designs) and I managed to get away for the day. We left before the sun was up, drove out to western MA, and got walking! 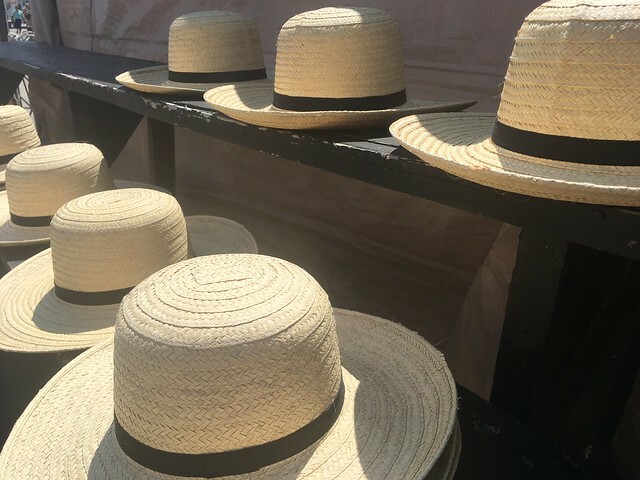 Each show has its own flavor, and July tends to have fewer vendors and fewer customers, because it can be the hottest weather (although sometimes September is pretty toasty, too). Having said that, though, there is still A LOT to take in. A few of my favorite vendors weren’t around, but despite that, we walked from about 7 A.M. to maybe 4:30 P.M. and found plenty to look at. No, that didn’t come home with me. That dress form made me laugh and cringe at the same time. I always go with a list of things I’m looking for for our house, my sewing practice, as gifts, or just fun things like jewelry and plants. I save some of my Christmas money toward this end, and don’t usually spend much, but always have a great time. Anything I don’t spend, I roll over for next year. I only get things I can use, because our apartment is small, and we don’t have wall or shelf space for knick-knacks. 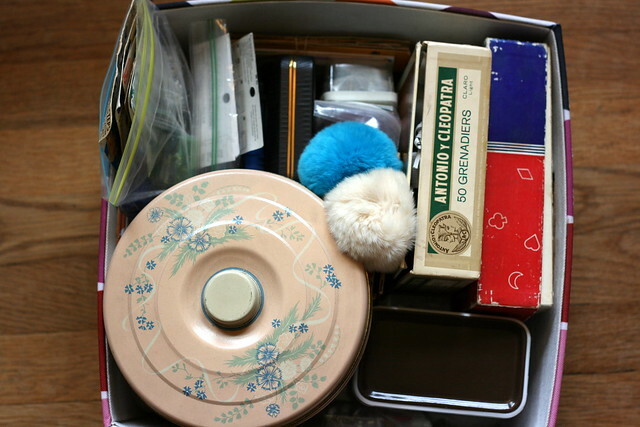 Storage items are always useful finds! I didn’t find any affordable pattern storage boxes, though. I’m not willing to pay a lot for those. 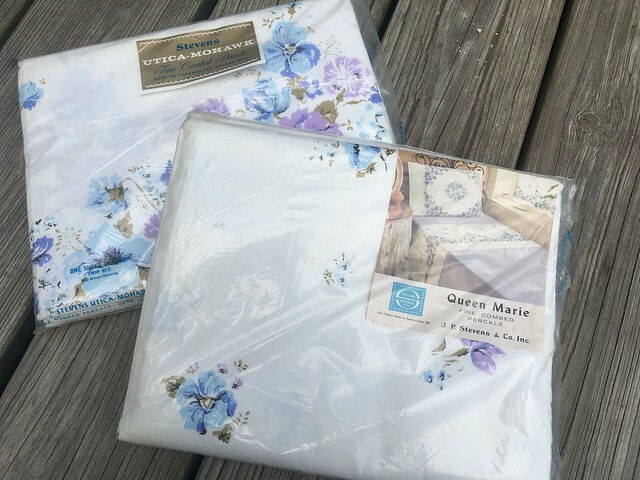 I didn’t find quite as much as usual this time, but I still came away with some good finds: deadstock top sheets with a great border print. 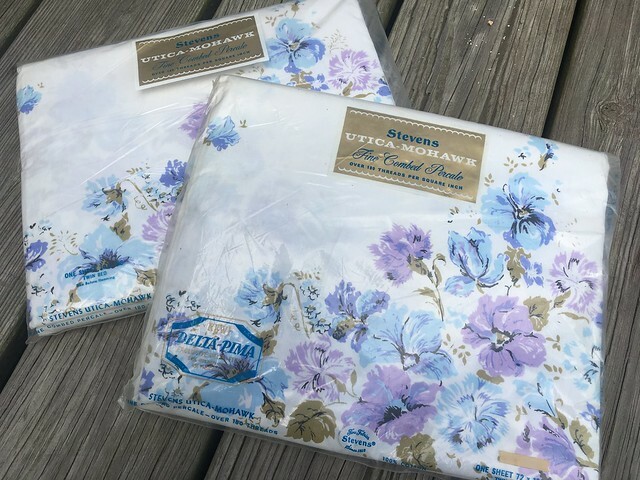 These were unused and unopened and are 100% cotton. I think they’ll make a great maxi dress. 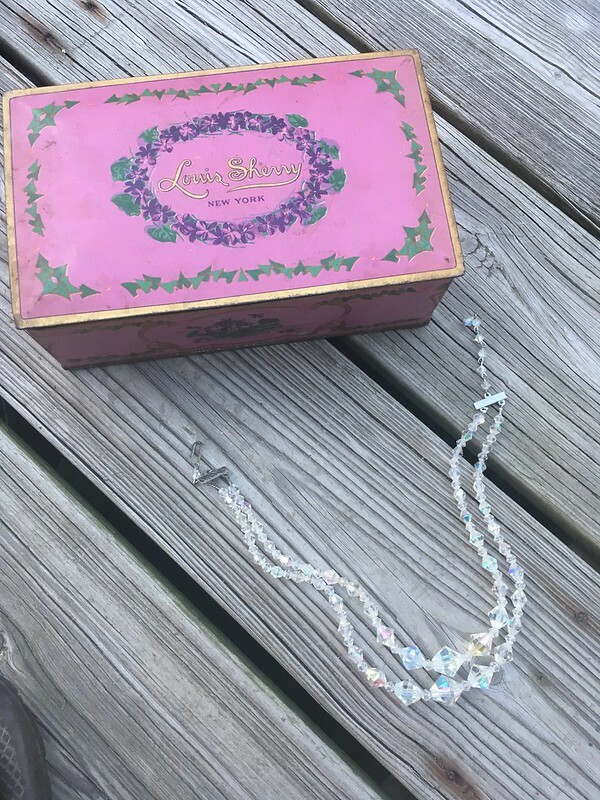 I found a sparkly necklace and this cute chocolate tin for gifts, but…bonus! 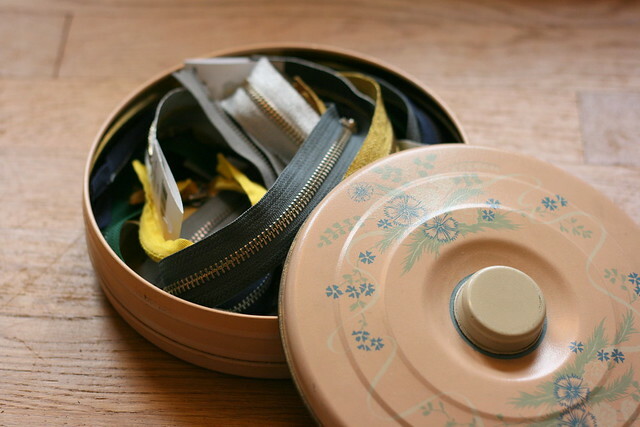 It was filled with sewing odds and ends for me! 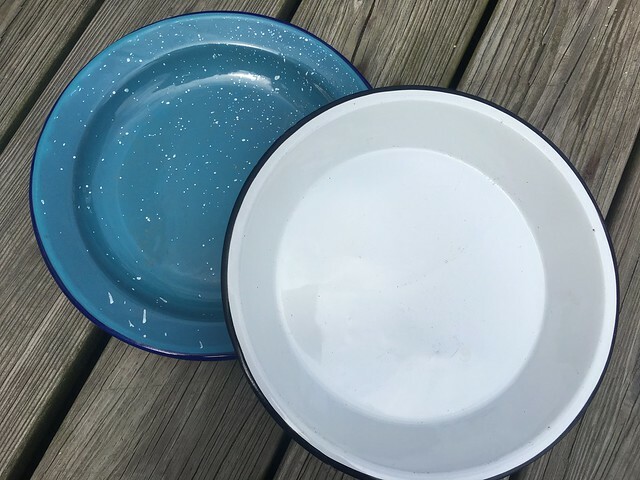 We needed some enamel ware for camping. Check! 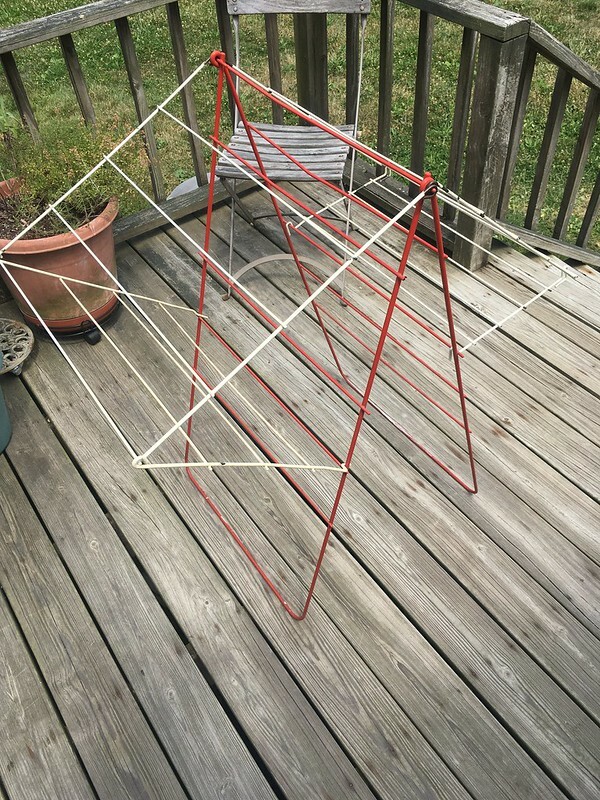 I also thought I would try out this folding drying rack for holding patterns that have been cut out but aren’t sewn yet. Right now I drape them over my husband’s chair and, while he’s very patient, I bet he would like his chair back. My favorite jewelry lady and plant lady weren’t in attendance, so no treasures from them this time. Not a huge haul, but a good one, nonetheless. Next year, if I get a chance to go, I’ll reevaluate this year’s list and roll anything over that I am still looking for. After a day full of walking and looking (and eating second-breakfast and a delicious lunch of Ben & Jerry’s ice cream), my friend and went to Cracker Barrel for dinner since it’s on our way home. What a great end to the day, and a wonderful chance to hang out with a dear friend! Don’t bring your young children. If you plan to make a full day of this, it’s a lot of walking and can get long and hot. Can you do it with kids? Definitely. Will you (and they) enjoy it? Probably not. Park in the middle so you can drop things off in your car as you go back and forth. Write down the fields your favorite vendors are in. After walking for a while, things start to look the same and the paths through the fields are sometimes curvy, which can make remembering exactly where you found that perfect item a little tricky when you are tired. My current favorite fields? New England Motel and Quaker Acres. Pack a cooler filled with water and leave it in your car. Plan to take a midday break with some water and a snack as you drop off your purchases so you can get that second wind to keep going! Wear sunscreen and be prepared for varying weather. Have fun and chat up the vendors. They are usually really friendly, really interesting, and great to learn from (whether you want to know the history of your latest find, its provenance, or the psychology of Brimfield). 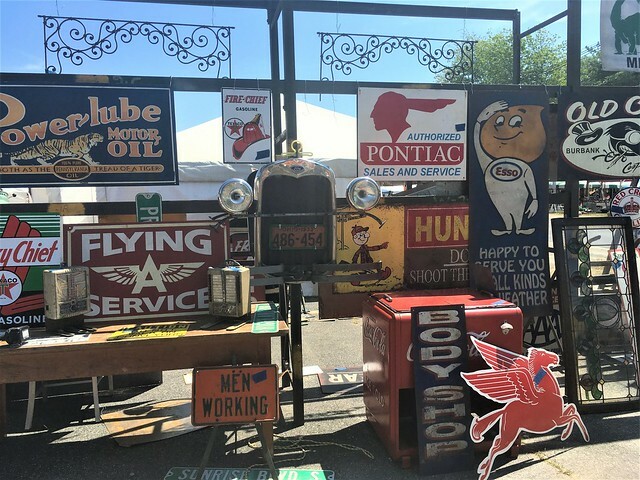 Do you have a favorite antique fair where you live? 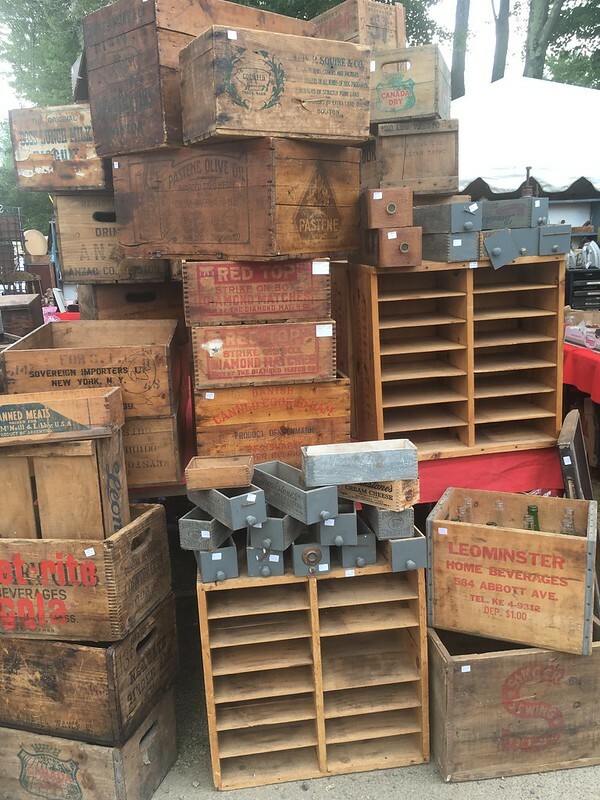 Have any tips to share or recommendations for fun flea markets/fairs to visit? Leave them in the comments! I’ve been thinking for a while about this post. 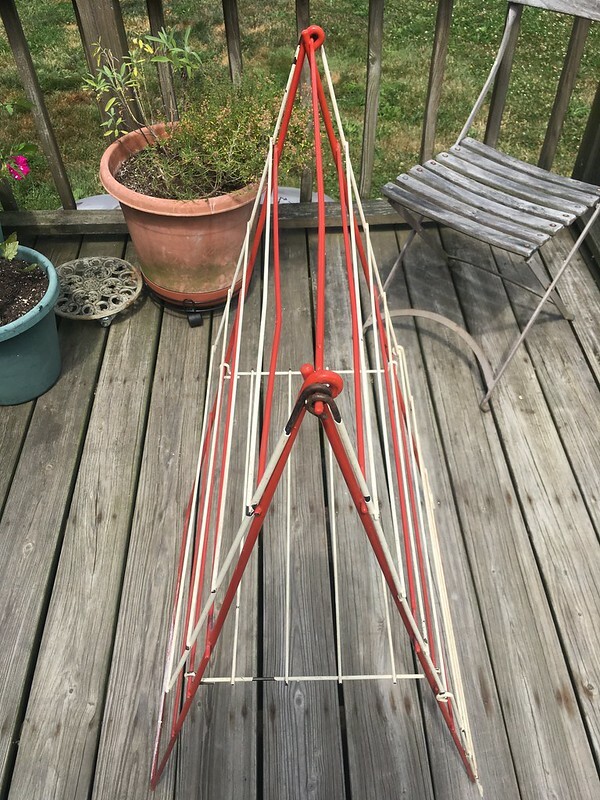 If you’ve been following my blog for a long time or have looked through past posts and seen a Brimfield post or two (or three), you’ll know that I love antiques. 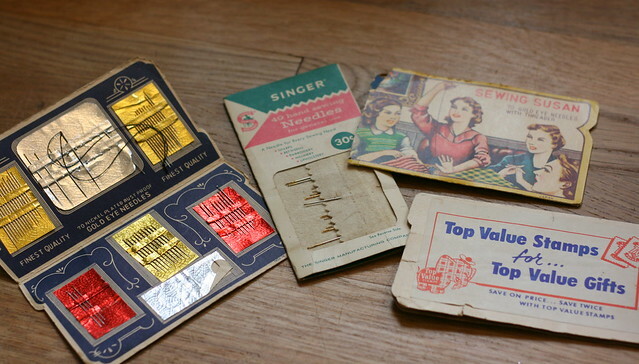 I’m not a collector of any particular thing, but I love items from the past that I can use in my everyday life. I like a bargain and a little patina. 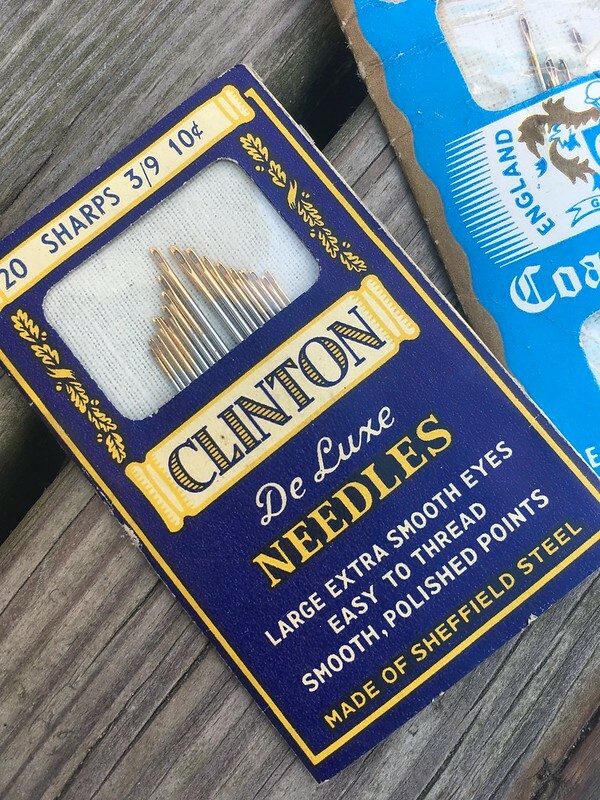 Wood, metal, glass, ceramic–those are the materials I like to look for, and many of them have been pressed into service for sewing. 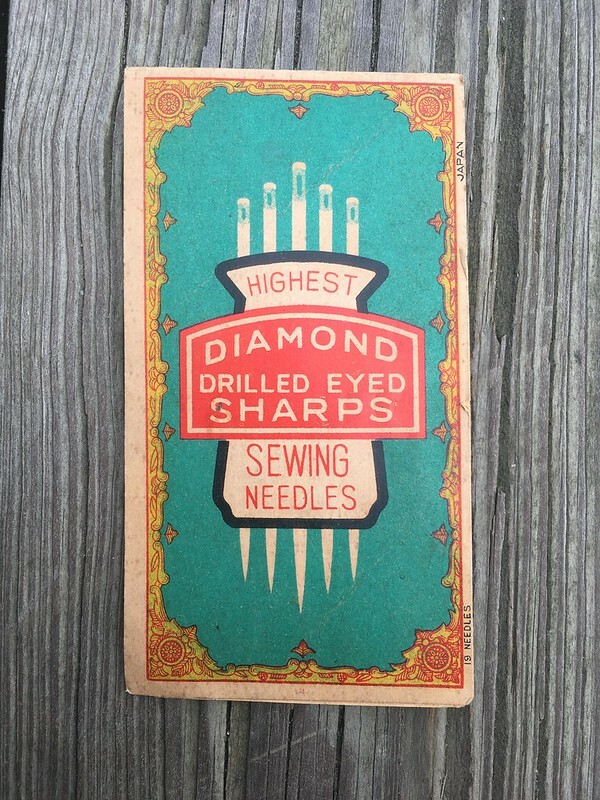 Thanks to some special items from family and friends as well as flea markets and roadside finds, I have some vintage sewing tools, but I also have some great storage solutions. That is what I want to share with you today. 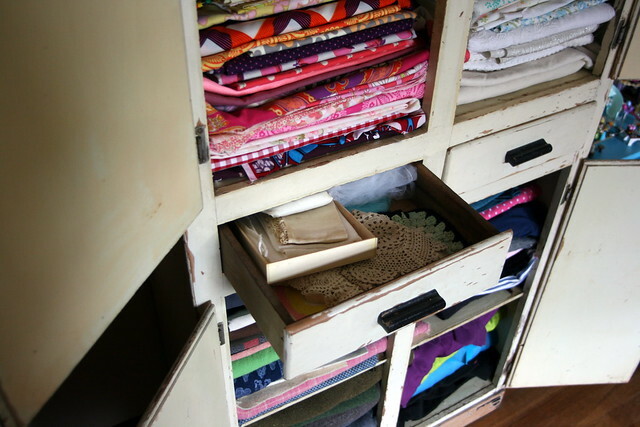 Maybe it will give you some ideas or maybe you have fun vintage storage solutions of your own that you’d like to share in the comments. 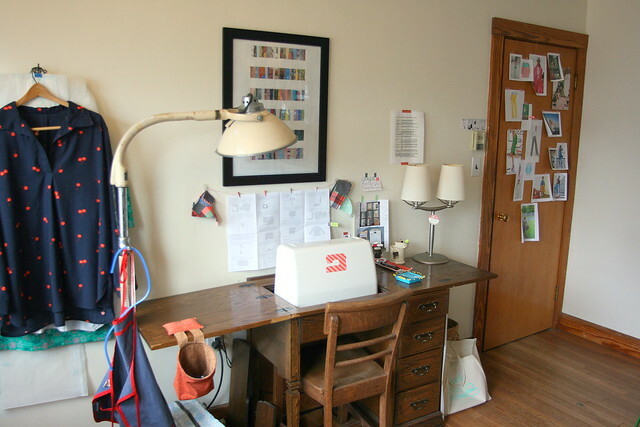 Here’s where I sew at one end of our living room. Most of my tools and equipment have been gifts, freebies, or bargains. The sewing table was my Mom’s and the chair belonged to my parents. That cool old medical lamp was a side of the road find. It’s not very bright, but the head can be moved to direct light onto your project and you can make the lamp taller or shorter. Here are a few more items I find useful. 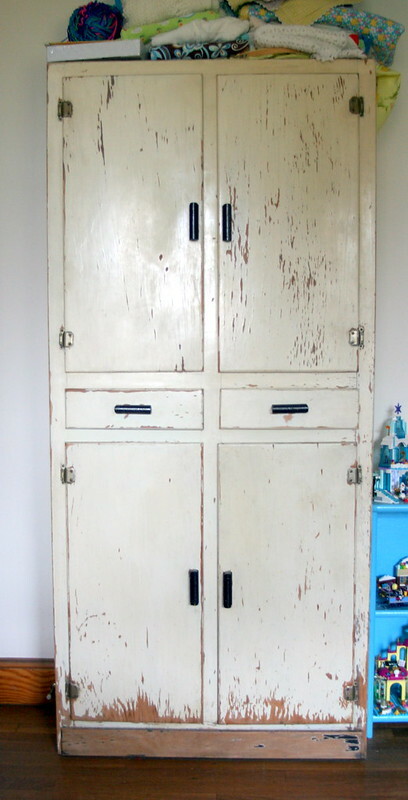 This is my fabric cabinet, found at a flea market. 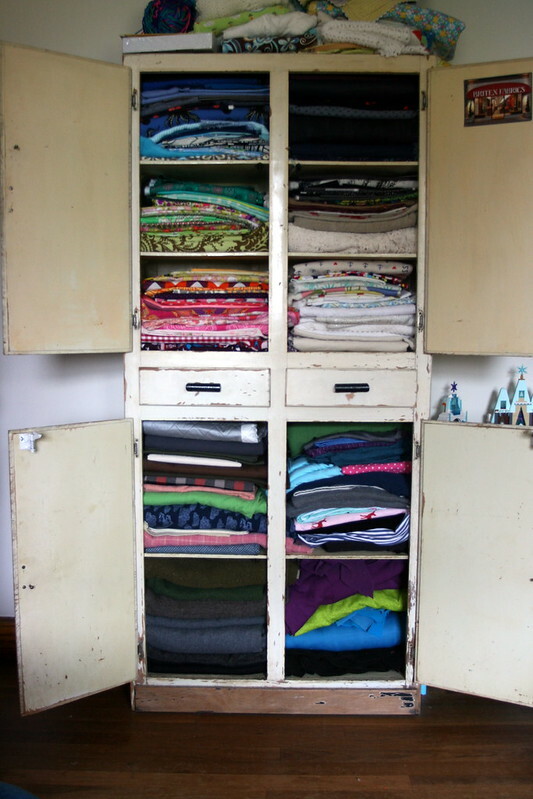 Fabric is organized somewhat by color and somewhat by type. 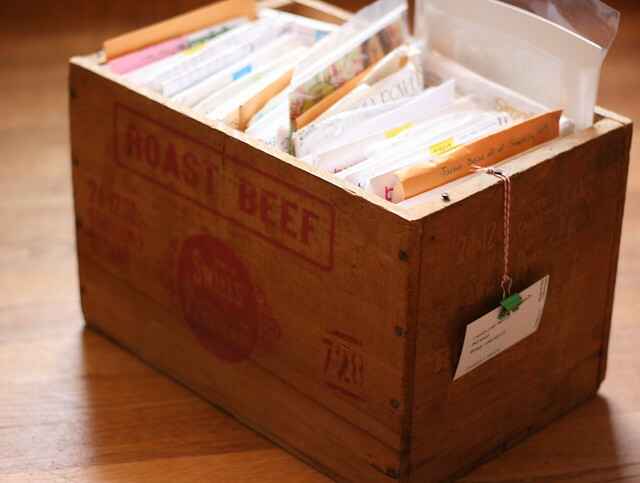 Those are the big items, but I also have some very useful smaller organizers–wooden roast beef and cheese boxes. 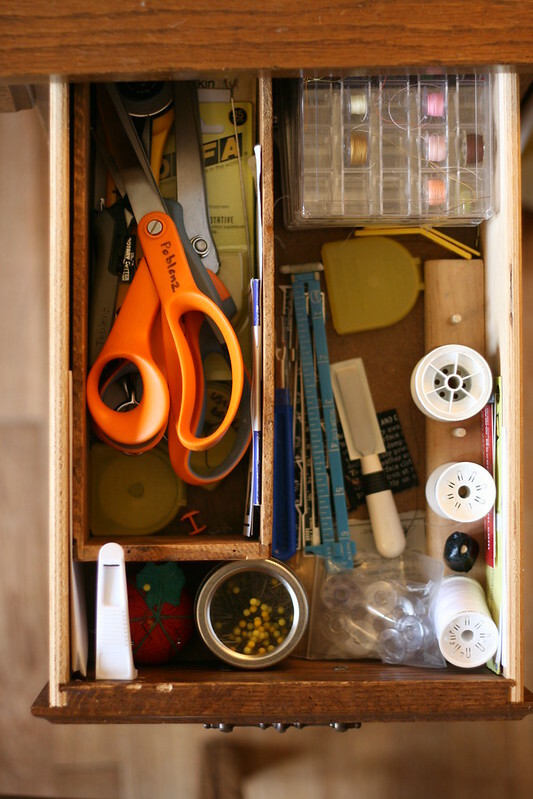 Patterns go in the roast beef boxes…and tools (and other items like trim) go in the cheese boxes. 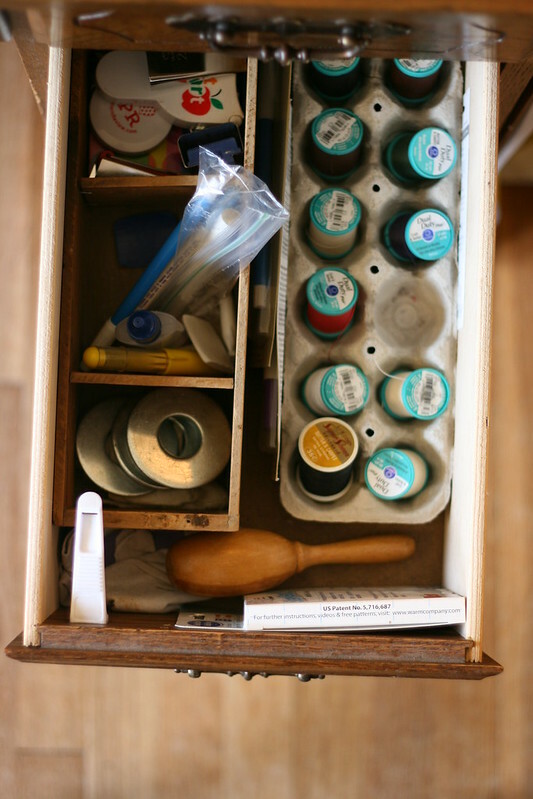 I also use cheese boxes in the drawers of my sewing table for organization. 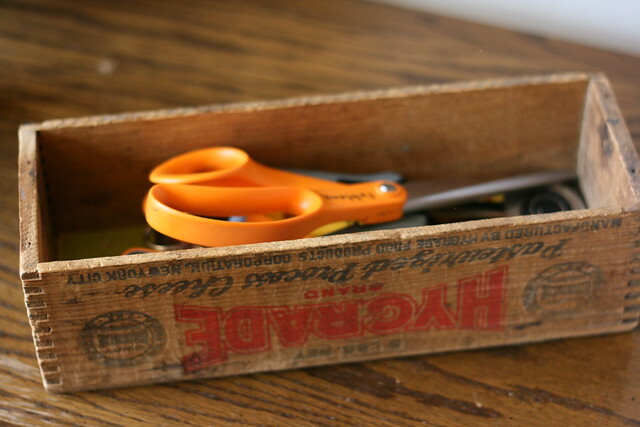 That’s actually where I keep my box of cutting tools. and really any old container that you like the look of and that will fit what you are trying to store. 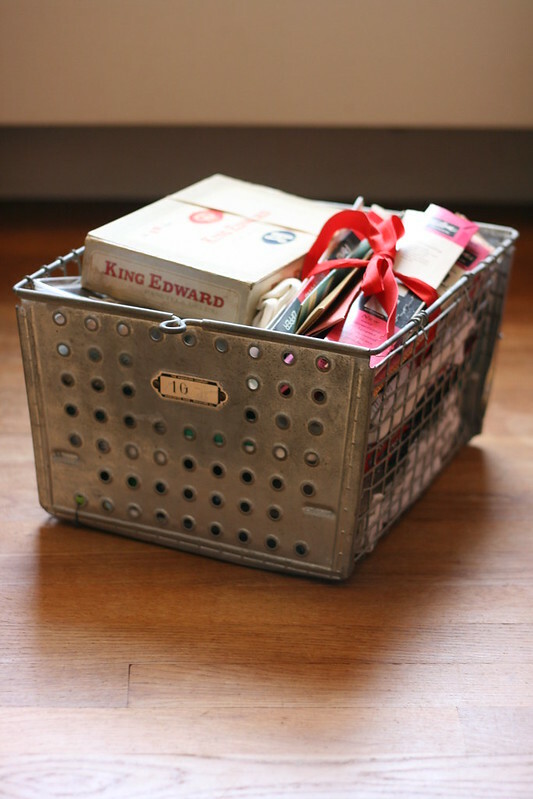 I also find old locker baskets useful, albeit somewhat pokey. 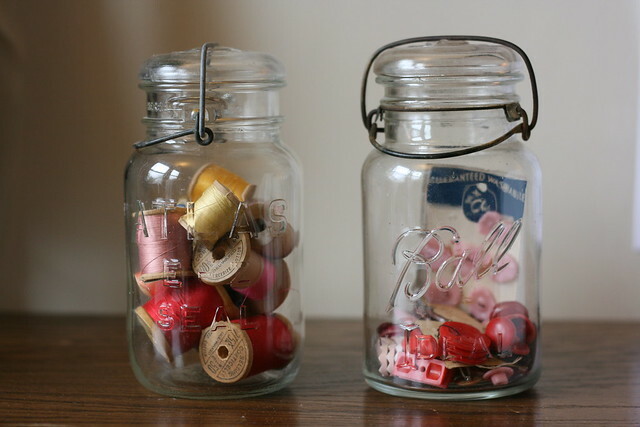 For buttons and old, but beautiful spools of thread, I often employ glass canning jars, which look great whether they are vintage or new. 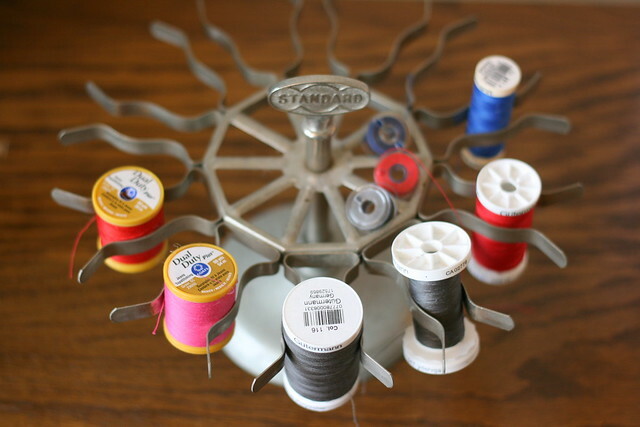 And on my sewing table/desk, I’ve found that an old stamp holder (if it’s not too rusty) can be useful for holding thread and bobbins for your most recent projects. 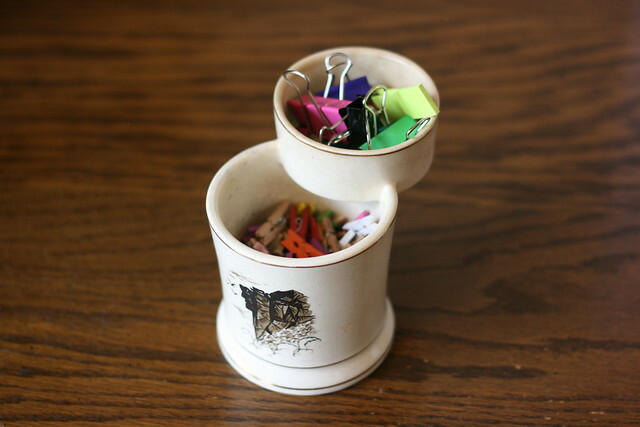 I also use this old shaving mug to hold binder clips for pattern pieces, mini clothes pins for my pattern instructions, and post-it tabs to help me keep my place in the instructions when I’m sewing. This one features New Hampshire’s “Old Man of the Mountain” who fell off the mountain some time ago, so…I guess it’s even more special now? 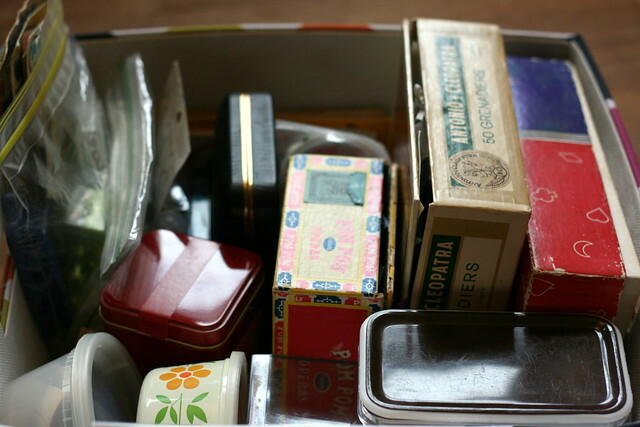 Once you get started organizing with vintage containers, it’s not hard to follow that up with a few vintage notions. Often people will give them to you if they are cleaning out and know you are interested. I love having tools and notions that were loved in the past and knowing I can use and enjoy them and give them a second life. 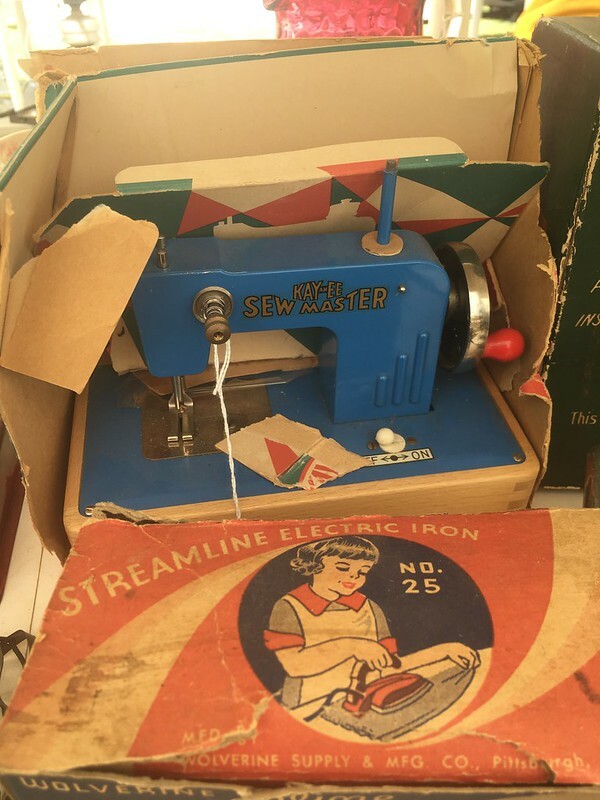 It makes my own sewing that much more special. 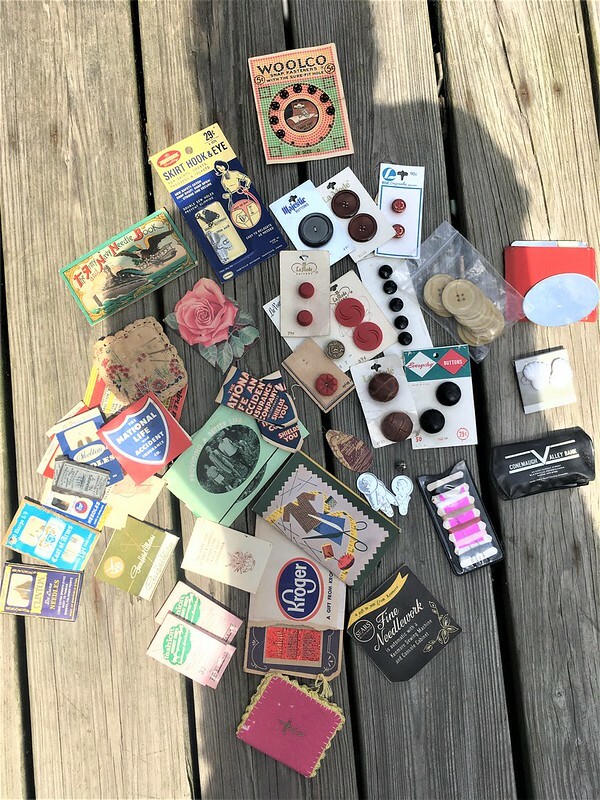 If you’re looking to add a little vintage flair to your sewing and/or your sewing organization, here are some of my sources. 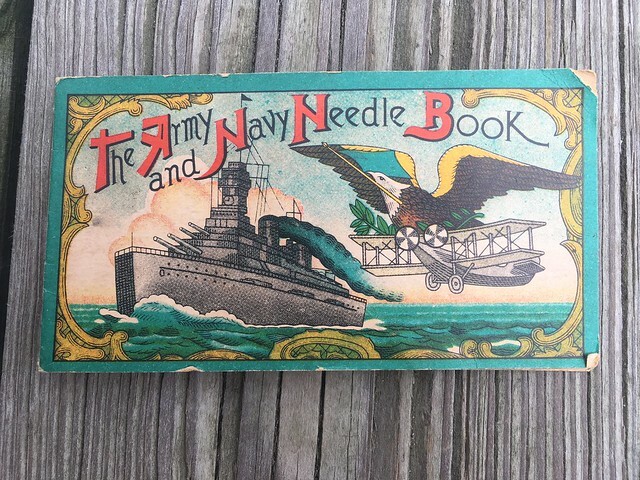 I will tell you, though, that I’ve loved old things ever since I was little, so this collection of special odds and ends didn’t spring up overnight. This is a great long-term hunt. Patience will serve you well. So, sources! Number one for so many of these items has been family. My parents and in-laws have often passed on things they weren’t using that I fell in love with. Once I started to sew and knit, family and friends also gave me tools from family members who had passed away, which was really special. 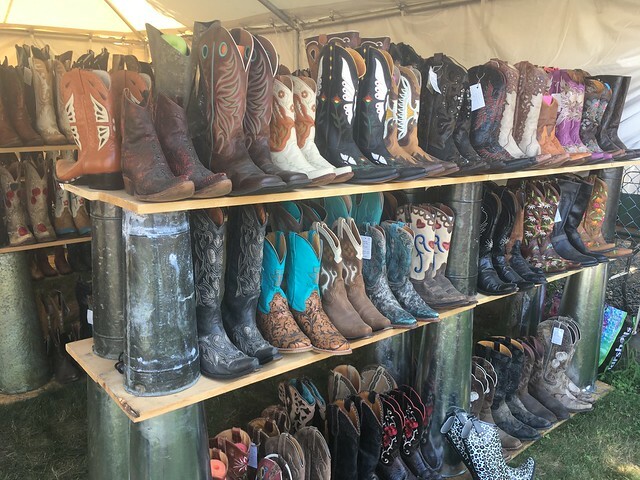 If you are near Boston’s North Shore, my favorite flea market is Todd Farm in Rowley, MA. It’s open every Sunday morning from approximately Easter to Thanksgiving. 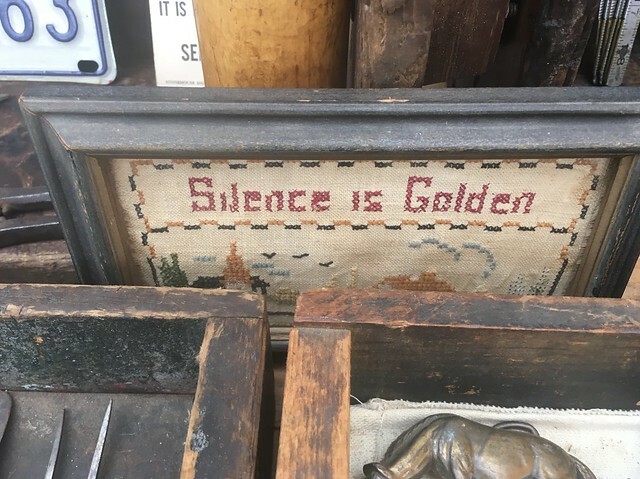 I like early-morning antiquing, so I go before church sometimes. 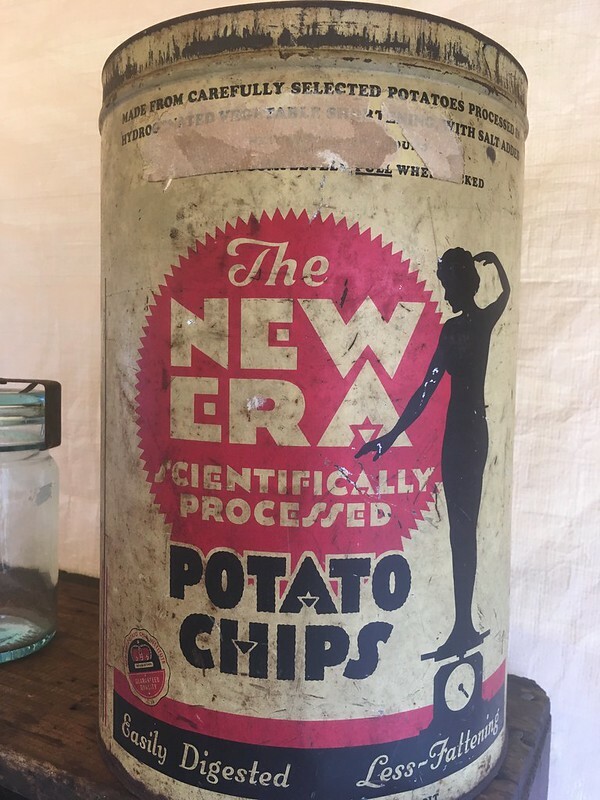 If you are within driving distance of western Massachusetts, I highly recommend Brimfield. The prices there are not as good (in general) as a small, local flea market like Todd Farm, but the selection is unparalleled. 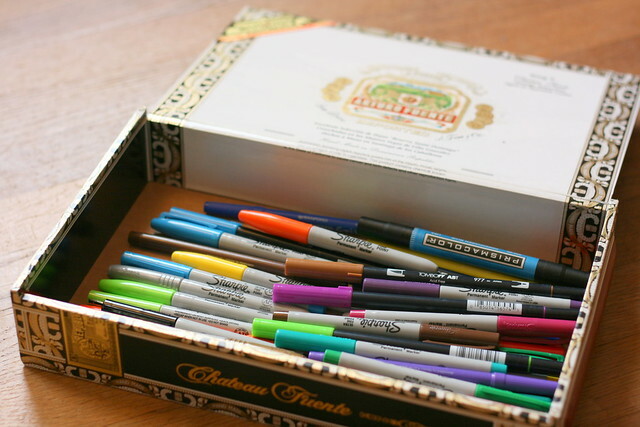 For cigar boxes, you can often buy them inexpensively (or sometimes get them for free) at cigar shops. They may not be vintage, but they often have that vintage look regardless. 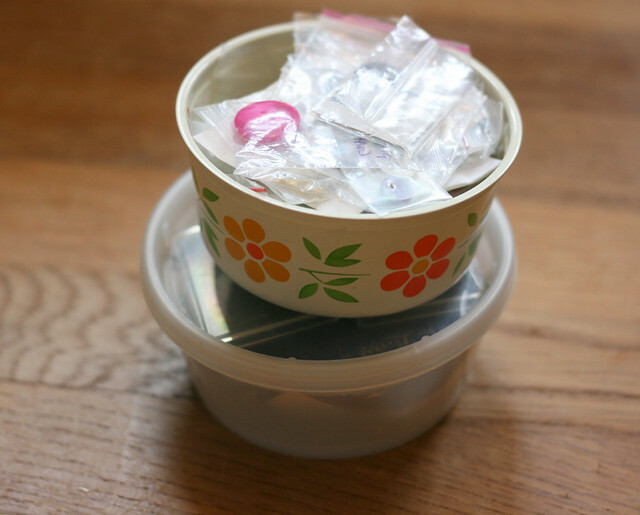 And consider using any containers that you find useful and beautiful like clean jars or tubs from food or other items. I also suggest yard sales, side-of-the-road freebies, thrift stores, and super junky bargain antique stores. Of course all of this takes time, but I love the thrill of the hunt and the opportunity to use things with a history. 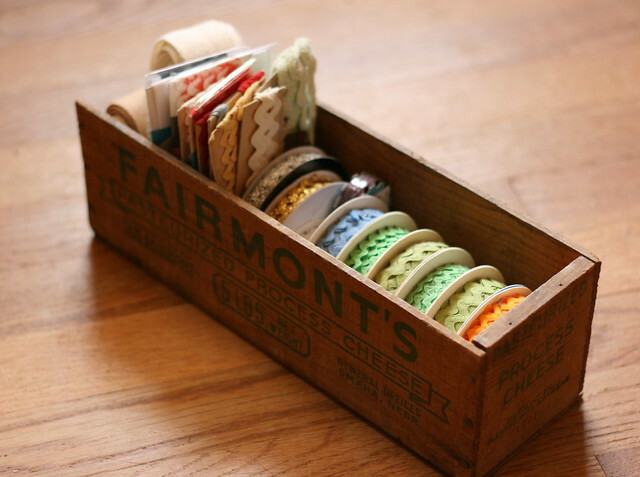 If you have any great tips for organizing or sewing with vintage items OR great sources for finding said items, tell me in the comments! Have you seen the new “stickers” from the McCall Pattern Company for iOS? It’s a free app with little sewing-related images that you can use on your phone (if you have an iPhone) or iPad. They are super fun to text to your other sewing buddies. 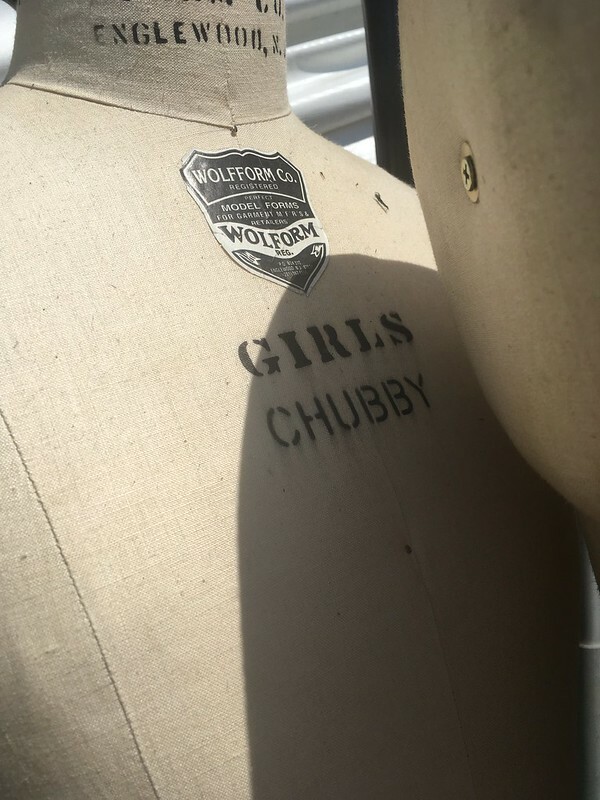 So, here’s a website/blog that’s new to me, but could prove very helpful: Shop the Garment District. 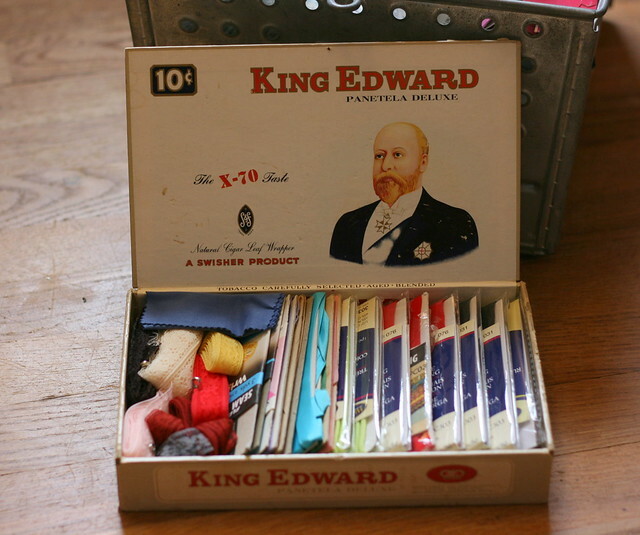 It’s about sewing and shopping for sewing goodies in New York City’s Garment District. 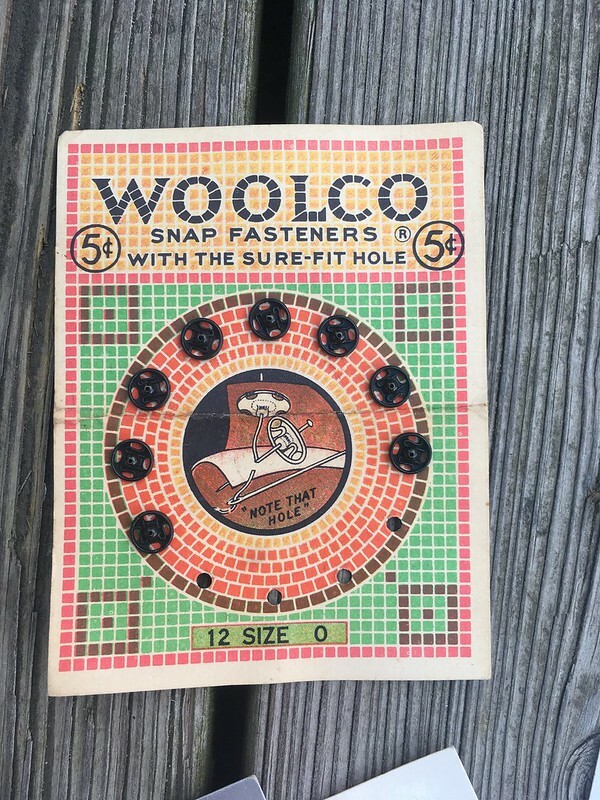 I heard about this site while listening to the Sew Forth Now podcast. This is an old podcast that you can still listen to by Lori from the blog Girls in the Garden. I’m finding some great resources through these. 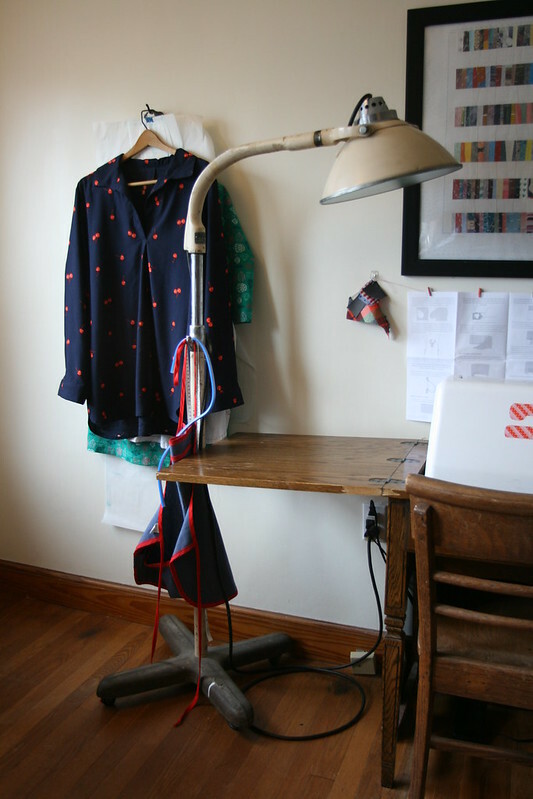 Lori’s blog (which she is still posting to) is also a great source for sewing inspiration as she tries lots of different patterns and fabric.